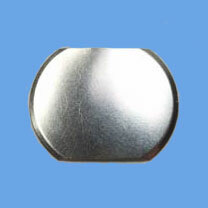 Oblong metal domes (Oval metal domes, rectangle metal dome) are oblong (oval) shaped switch contacts that were designed for mounting on double sided printed circuit boards, flexible circuits and membranes. Applications requiring a low profile switch on an overly populated circuit board are a perfect fit with our C and O-Series metal domes. The O-Series metal domes can be used in a long & narrow space than other three shape domes. The size for small one is like 3*4mm, 3.7*5.0mm, 4.2*5.6mm, and medium one as 7.1*8.9mm, 5.6*11.28mm, 8.89*17.78mm, and bigger one can be 12.7*25.4mm, 38.1*12.8mm, even 51*13.70mm. Sometimes people also call it "rectangle dome". The trip force of O series dome is typically 100- 500gf, and its rebound/return force, click, travel, height, etc., can be adjustable according to clients' request. No matter what size or force you require, we'll do our best to produce it. Contact us now for more! Best Technology is the professional manufacturer of metal dome, snap dome, metal dome array, LGF (light guide film) in China, with different package: in PE bag, Tube, pick & place reel. We can also provide metal dome array assembled on PCB and flex circuits. Whatever type of trip force of metal dome or dome array you need, we will make it happen.